Are you looking forward to “Zootopia” The newest Disney/Pixar film? Check out the cool new poster, and the funny trailer, I am sure this film will become a classic! 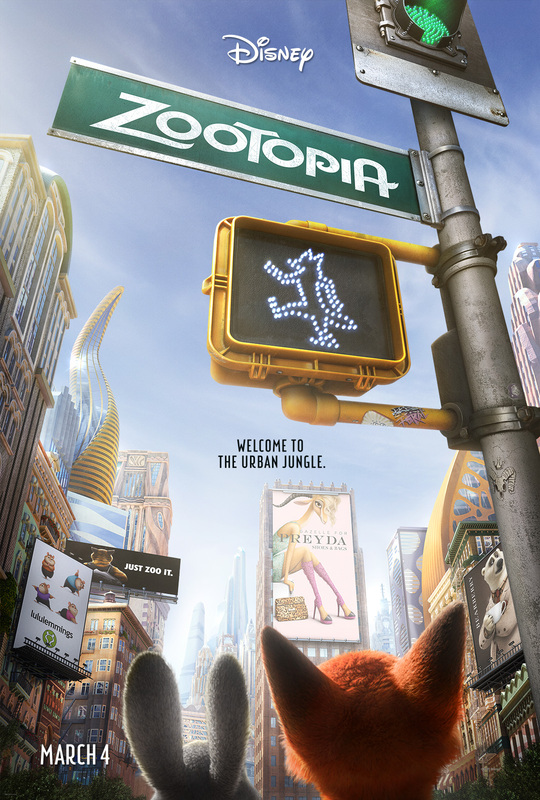 Zootopia opens in theaters on March 4, 2016. The modern mammal metropolis of Zootopia is a city like no other. Comprised of habitat neighborhoods like ritzy Sahara Square and frigid Tundratown, it’s a melting pot where animals from every environment live together—a place where no matter what you are, from the biggest elephant to the smallest shrew, you can be anything. But when optimistic Officer Judy Hopps (voice of Ginnifer Goodwin) arrives, she discovers that being the first bunny on a police force of big, tough animals isn’t so easy. Determined to prove herself, she jumps at the opportunity to crack a case, even if it means partnering with a fast-talking, scam-artist fox, Nick Wilde (voice of Jason Bateman), to solve the mystery. Walt Disney Animation Studios’ “Zootopia,” a comedy-adventure directed by Byron Howard (“Tangled,” “Bolt”) and Rich Moore (“Wreck-It Ralph,” “The Simpsons”) and co-directed by Jared Bush (“Penn Zero: Part-Time Hero”), opens in theaters on March 4, 2016. ZOOTOPIA opens in theaters everywhere on March 4th, 2016! Are you excited to see Zootopia? What cute characters, can't wait to hear more about it and see the previews. This looks fun. I think my niece would love it. I love Disney Films. This one does look fun and exciting with cute characters. We would like to see this next year.